Here’s the location for the AK 47 in the Narco Road DLC of Ghost Recon Wildlands. This guide will show you the location of the AK 47 in Ghost Recon Wildlands Narco Road DLC. While it won’t show up on your map until you get some information from an informant, you can grab it using our guide any time. To unlock more guns, continue to increase your followers by completing missions and activities, and then speak to informants when they show up on your map. A zoomed out look at the location for the AK 47 in Narco Road of Ghost Recon Wildlands. You can find the AK 47, which is fully customizable, in the Los Kamikazes territory. 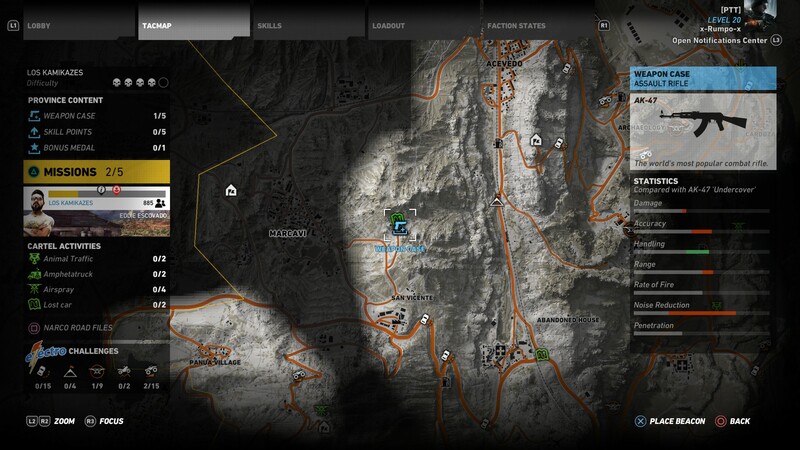 It’s in a small Unidad base that is east of the city of Marcavi, and there is a Lost Car mission at the same location. In fact, you could easily find the AK 47 by heading straight for the Lost Car marker. If you aren’t with a co-op squad, you can expect a bit of trouble (but not much) taking down the base by yourself. We don’t have the patience for that, so we utilized the Guns for Hire perk and wiped everyone out in quick order. When it’s all clear, look inside a brick building with no door and you’ll find the AK 47 Weapon Case. You’ll also find an ammo crate there so you can top yourself off before moving on. 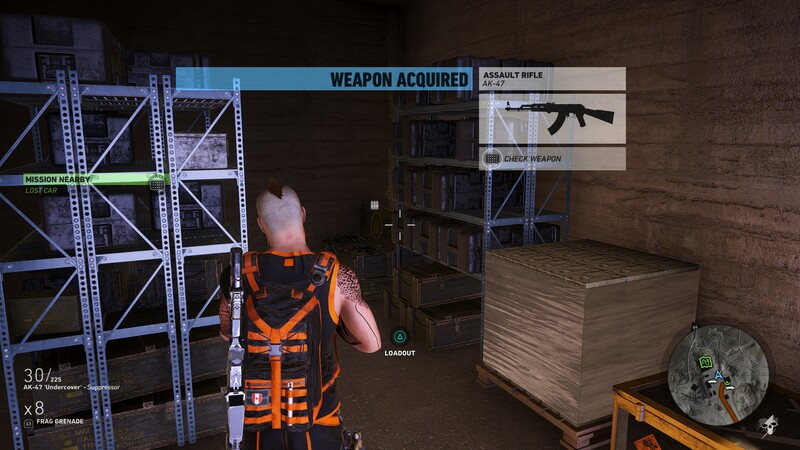 Clear out the Unidad troops and grab the AK 47 from the Weapon Case. 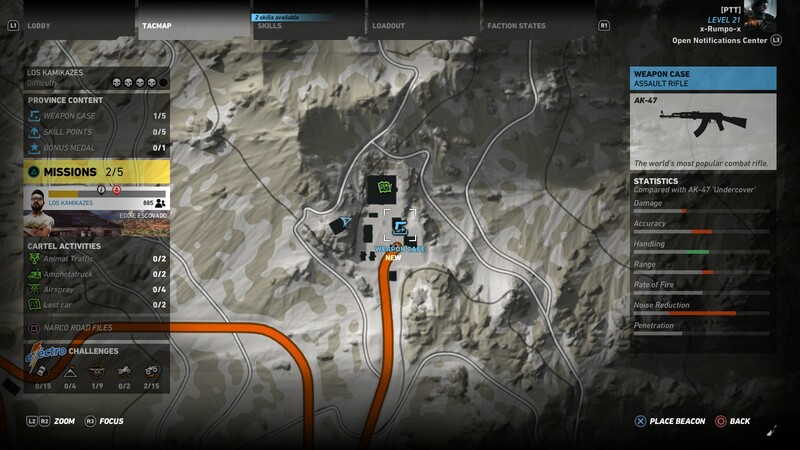 Before you leave the base, make sure to tag any supplies that are around, and then you might as well do the Lost Car mission to gain more followers, something that is essential if you want to unlock the locations of more guns in Ghost Recon Wildlands Narco Road. There are a lot of guns that you should consider unlocking in Ghost Recon Wildlands, one of which is the very cool looking Dragonbreath Light Machine Gun. For now, however, you have the AK 47 location in the Ghost Recon Wildlands Narco Road DLC.